Bringing together music students, members of previous non-award ensemble programs, talented CYM students and anyone from the community (via an audition), new group, Dragonflies, allows you to hone your skills in an orchestral setting along with other classical guitarists. Adrian Walter, highly experienced conductor and guitarist, will conduct Dragonflies. 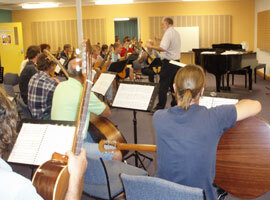 The group will be lead by Stephan Bulmer, lecturer in guitar at Charles Darwin University. Rehearsals will be held on Thursdays at 5.30pm in the CDU Theatre (Building 17) or in the Performance Room (Building 16), on Casuarina campus. For further enquiries contact Stephan Bulmer on 8946 6586.